On Oct. 19 the Maker Hub in Lauinger Library hosted its grand opening for students, faculty and staff. The Maker Hub will serve as a collaborative space for Georgetown community members to make things using technology, as well as a central location for tech and creative groups. At the event, student workers in labcoats demonstrated the various technologies available for student and faculty use, as visitors explored the Maker Hub’s meeting spaces and workstations. Workstations will include a 3D Printer, 3D scanner, a soldering station, power and woodworking tools, a textiles station with a hand loom and sewing machine, a vinyl and a laser cutter, and an electronics station with Arduino and Raspberry Pi embedded computing platforms. 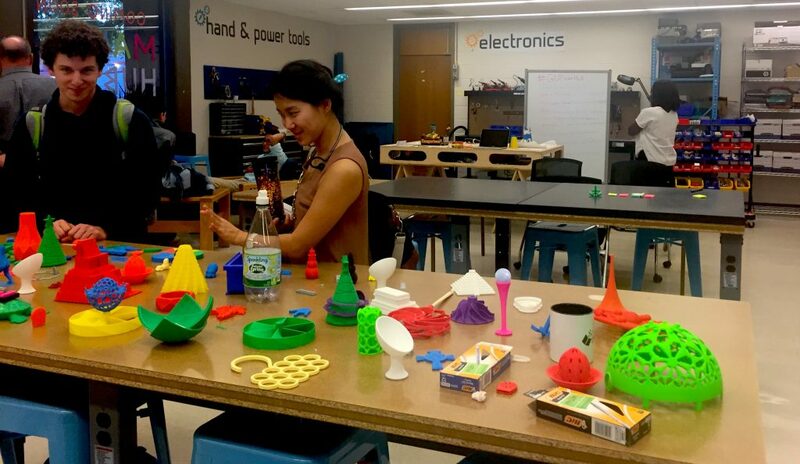 After attending workshops or setting up consulting sessions, students will be free to use equipment during the Maker Hub’s open hours posted on their website. According to Beth Marhanka, department head of the Gelardin New Media Center, the Maker’s Hub occupies space that formerly held stacks of government documents. She attributed the program’s inception to library officials’ willingness to innovate. “The library leadership has been extremely supportive,” she said. Marthanka compared the Maker Hub’s opening to that of the Gelardin New Media Center, which began 15 years ago with only three antiquated cameras. “One reason that we named it the Maker Hub is that there are lots of other places on campus that are doing creative things, but we wanted a space where all of you could come together and meet each other and talk about creativity and making things,” said Marthanka. The Maker Hub website offers space for relevant student and academic groups to advertise. Maker Hub manager Don Undeen is most excited for the mentoring aspect of the space. “That’s the thing I actually get most excited about: working with people to do neat stuff,” he said. In the next six months to a year, Undeen hopes to see half-finished projects all over the Maker Hub. “I want it to look messy,” he said. Undeen formerly served as the senior manager of the Media Lab at the Metropolitan Museum of Art and currently sits on Vatican Art & Technology Council’s “Creative Lab” Committee. The Maker Hub will be a space for student clubs and classes to use. 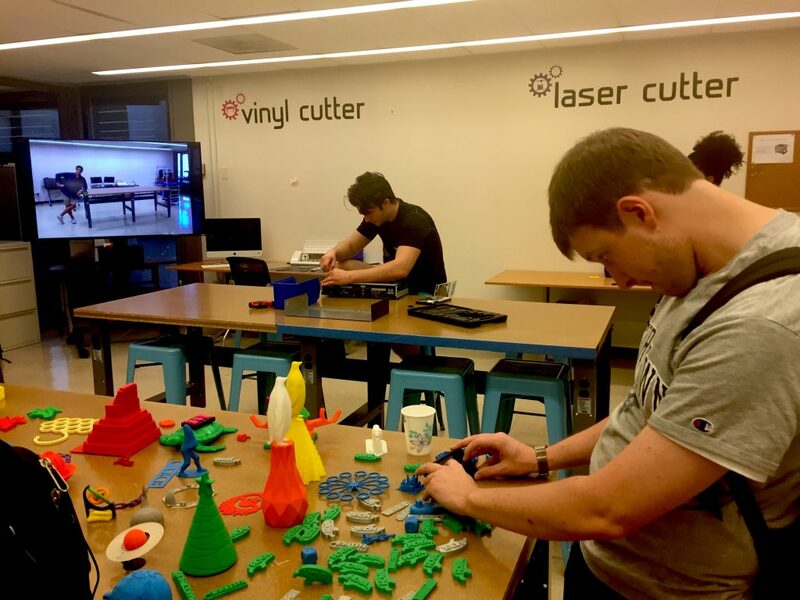 Justin Ho (MSB ‘20), president of Georgetown University Technology and Engineering Club (GUTECH), hopes the Maker Hub will serve as a central location for his new club’s operations. “I’m planning to use the Maker Hub as a base for our activities and our meetings because there’s a lot of equipment here, a lot of great resources and I want people to be able to take advantage of that.” He looks forward to seeing how the space will grow in the future. Calvin Dass (MSB ‘20) hopes to use the Maker Hub frequently. “I’m excited because I used to do this stuff a lot back home and it’s nice to be able to continue my passion here.” He thinks he’ll be using 3D printing and soldering most to create projects like the sensor based irrigation system he made in high school. Student-worker Cassandra Agyemang (SFS ‘17) applied to become a Maker Hub Mentor in order to express her creativity through her hobbies of knitting and crocheting. “I just really love using my hands and I realize that I’m a physical learner, so it’d be a good place to learn some skills.” She emphasized that the space would provide an opportunity for people to collaborate. Undeen sees maker spaces as relevant to Georgetown students because they provide skills for foreign service problems like conflict resolution and refugee crises. “When you consider the hands-on creativity, the ability of people to create their own solutions instead of waiting for people to give it to them, that kind of stuff has a real big impact on policy,” Undeen said. “The neat thing about maker spaces is that they’re promiscuously enthusiastic about being involved in different types of groups,” he said.